Beethoven, Ludwig van, 1770-1827. Sonatas, violoncello, piano, no. 3, op. 69, A major. Allegro ma non tanto (Album leaf) . Beethoven's Sonata for violoncello and piano no. 3, op. 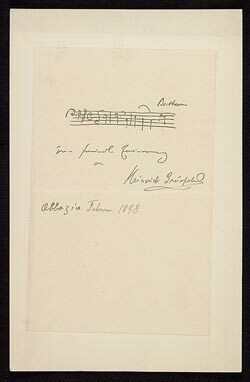 69, in A major (album leaf) : manuscript in the hand of Heinrich Grünfeld, 1898 Feb.